Nippon Kodo's Morning Star Incense is one of the most popular brands of Japanese incense. Crafted from pure floral essences and rare aromatic woods, Morning Star can be enjoyed every day. Each box comes with a ceramic tile incense burner. Like Sume-e paining and haiku poetry, the Japanese art of incense (or Koh as it is known in Japan) is famous for its mystery and subtlty. 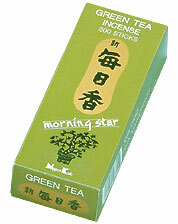 Morning Star incense, the perenial favorite and best-selling line of Japanese incense, embodies both of these qualities. Much more sutble than Indian or Tibetan incense, it invokes the mysterious fragrances of the natural world without overwhelming you with smoke. Morning Star is the perfect "every-day" incense. It is equally suitable for meditation, relaxation, setting a peaceful mood for discussion, reading or listening to music. Each box of Morning Star incense comes with a ceramic tile incense burner, but we prefer to use a ceramic bowl burner filled with sand. Morning Star is available in either 50 or 200 stick boxes in 12 different fragrances, or key notes, opening up the possibility of "composing" your own symphony of fragrance by mixing and blending. A few favorite combinations to try are Green Tea and Vanilla, Cedarwood and Pine, Sandlawood and Musk, or Jasmine and Lavender. The possibilities - and pleasures - are endless as you combine two or more of these remarkable scents. Please share with us your favorite combinations!